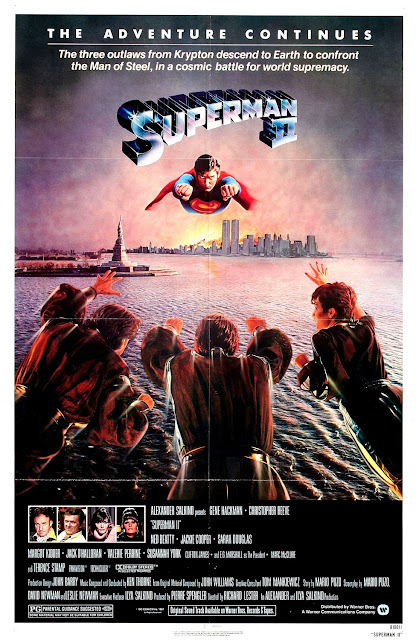 Three criminals from Krypton, General Zod (Terence Stamp), Ursa (Sarah Douglas), and Non (Jack O'Halloran) are released from their prison in the phantom zone when a nuclear bomb, thrown into space by Superman (Christopher Reeve), explodes. They head to Earth and learn they have powers identical to Superman. They start to take over the planet and only Superman can stop them. However, he has just relinquished his powers so he can be with Lois Lane (Margot Kidder), leaving him powerless to stop them. Ever since "Superman: The Movie" was initially green-lit, a sequel had been in the works. Much of the sequel was actually shot in 1977 simultaneously with "Superman: The Movie" by Richard Donner, the director of the first film. In fact, the original was supposed to end on a cliffhanger. However, the set of "Superman" was wrought with conflict behind the scenes. Richard Donner was either removed from his duties as director or quit the project entirely depending on which story you believe. Donner was replaced by Richard Lester, who resumed shooting the movie in 1980. Donner and Lester had very different styles and tone in their approach to the film, but the final product managed to blend the two together quite well, and if you didn't know there was a controversy, you'd probably never be able to tell two people were involved in making "Superman II." Christopher Reeve returns as the titular Superman, picking up right where he left off in a wonderful fashion. Like we said in our review for the original film, he is and has always been perfect for the role. Reeve plays the part so well, it's hard to distinguish what's Reeve and what's Clark Kent/Superman. Also returning in this film are Margot Kidder as Lois Lane, the intrepid reporter and Superman's love interest. Terence Stamp, Sarah Douglas, and Jack O'Halloran play Zod, Ursa, and Non, the villains of this film. These are the characters who had a brief cameo at the beginning of the original before being exhiled to the phantom zone. Gene Hackman plays Lex Luthor again as well...well, sort of. Hackman actually shot all of his scenes for this sequel back in 1977 with Richard Donner. Anything shot by Lester used a body double and a voice impersonator. All of the cast does a great job in their respective parts and are believable in their roles. It's fun to see the villains getting a bigger role this time around, too. We really enjoy the story in this sequel, which is something we can't usually say about sequels. Superman faces conflicts he hasn't in the past. He gives up his powers at one point so he can finally be with the love of his life, Lois Lane. Unfortunately, he learns very quickly what it's like to be human. It is a good attempt to humanize what has essentially been portrayed as a god-like being and we enjoy the vulnerability Reeve portrays as a human. In the end, this film becomes a battle of the gods: one benevolent hero versus the other malevolent villains. When it's all said and done, despite all the conflict behind the scenes and a little bit of a sillier approach due to the splitting of directors, what wound up on screen is still a solid, worthy sequel for the man of steel. One year ago, we were watching: "Two Days, One Night"